Gillian Anderson, Paying a Visit to 'Bleak House' A new film production of the Charles Dickens novel Bleak House will make its debut on PBS Sunday night. 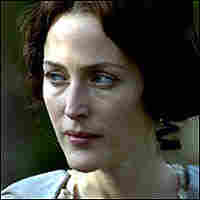 Gillian Anderson, of X-Files fame, plays Lady Honoria Dedlock. She tells Scott Simon about her role. A new film production of the Charles Dickens novel Bleak House will make its debut on PBS Sunday night. The story, told in weekly installments through Feb. 26, is an indictment of long, drawn-out lawsuits in Victorian England's Courts of Chancery. But, as with many Victorian novels, it's also about lust, murder and greed. Gillian Anderson, of X-Files fame, plays Lady Honoria Dedlock, one of more than 40 characters who wander through the twisting plot. She talks with Scott Simon about her role.